The last week has not been good on the running front. There are many reasons for this I know, but none of them make me feel any better about it. I have not yet, since Monday run in the morning before work, and every other normal week I am up and running before work or church at least 6 days. This past weekend my wife and I made a trip to Indiana (from Atlanta). The trip comprised of a total of 24 hours of driving, three nights of between 4-5 very uncomfortable hours of sleep. OK, the third night was back home and was much more comfortable, but was still only 5 hours. Monday morning I just couldn't make it out of bed any earlier because of the lack of sleep so I decided to run in the evening. I did get a 3 mile run in, although I had set out to run 4 easy miles. The run was not the worst I have had, but my body was fighting me the entire way and I was completely out of energy. Tuesday morning was yet another no-run morning as I try to recover some of the lack of sleep. I always run with the Fleet Feet Running Group on Tuesday nights so this was not a big deal. Tuesday's run was designed as a recovery run so we took it easy for our 5 miler. Both my daughters ran with me until the first loop had finished. Ashlee stopped after the first loop because she had a workout this morning and wanted to be fresh for it. Payton went ahead and did the two loops with me and we finished strong.... stronger than I had intended. This run was the best one I have had all week, although I am still feeling very short of energy. I am hoping to catch up on my sleep in the next day or two because the Peachtree Road Race 10k is this Sunday, and it is the first time my daughter Payton will be running it. We both have time group A numbers and we are really looking forward to it. I really would like to set a new 10k PR, but I am not sure this is the race that it will happen in. My 10k PR is 48:03 from a couple years ago before my broken collar bone, and last years Peachtree Road Race was 48:32 following a hard recovery after 8 months off. I would like to drop down into the 47's but I am not sure what the day will hold following a week like this. Tonight is all I can worry about right now. I am going to try to get at least a short run in tonight. I will need to wait till it cools off a bit, but hopefully I can get a good energy filled run in finally! How do you feel about sleep (or lack thereof) and how it affects your running? Either leave a comment here or stop by my Facebook Fanpage (www.facebook.com/262quest) and answer the question. You can do it! Keep the faith! Good luck! Nice to know someone else is going through this. Keep your head up, it will get easier. I will do the same. I continuously struggle with lack of sleep on weekdays, then sleep 13 hours on a weekend to attempt to make up. It definitely affects my running. Sadly, I told myself I'd be in bed by 9 p.m. tonight and yet it's now 10:27... 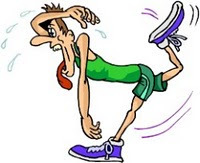 Sorry to hear that you've had a challenging week... Hope to see you Sunday at the Peachtree Road Race! I have had several stretches like this where is seems like every run is a struggle and they always just go away. Just chalk it up to the running gods (and other factors) not being on your side this week. Good luck on the Peachtree and hope you meet you goal, although I would imagine the number of runners there makes it a difficult on to PR. I am one of those weird people that can function on 4-5 hours of sleep, so that does not usually affect my running. Although I am sure I would run better with more sleep. Good luck, I'll be up in the A's with ya! I ran the course last week and it's just as hot and hilly as ever, sure to be good times! I for one need at least 6 hours of sleep or this (see above) happens to me. This is the worst I have had it since starting to run almost 4 years ago. I am starting to feel more like myself, although I am still wondering what I need to change so I can start speeding up..... I am tired of not getting enough return on my investment. I guess I have some reading to do! !